The National Flag: Bhutan’s National Flag is divided diagonally: the upper diagonal is yellow and the lower orange. Separating the two diagonals is a white dragon facing away from the hoist side. Yellow signifies the secular tradition and authority of the King and orange the Buddhist spiritual tradition. 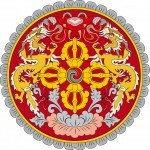 The dragon represents the name of the kingdom: Druk Yul or Land of the Thunder Dragon. 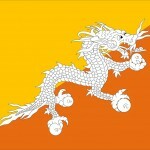 The dragon signifies purity and the jewels held in the dragon’s claws represent Bhutan’s wealth and security. 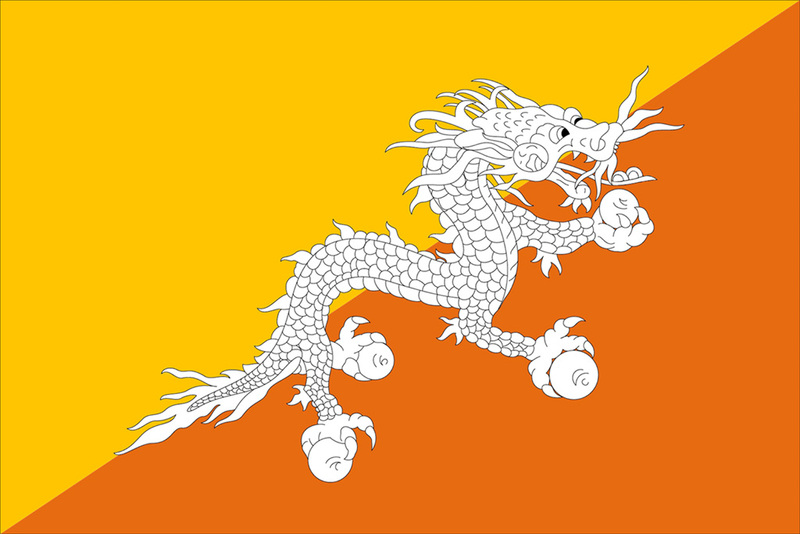 The dragon’s snarling mouth symbolizes the Bhutanese guardian deities’ ferocious commitment to protect the nation. 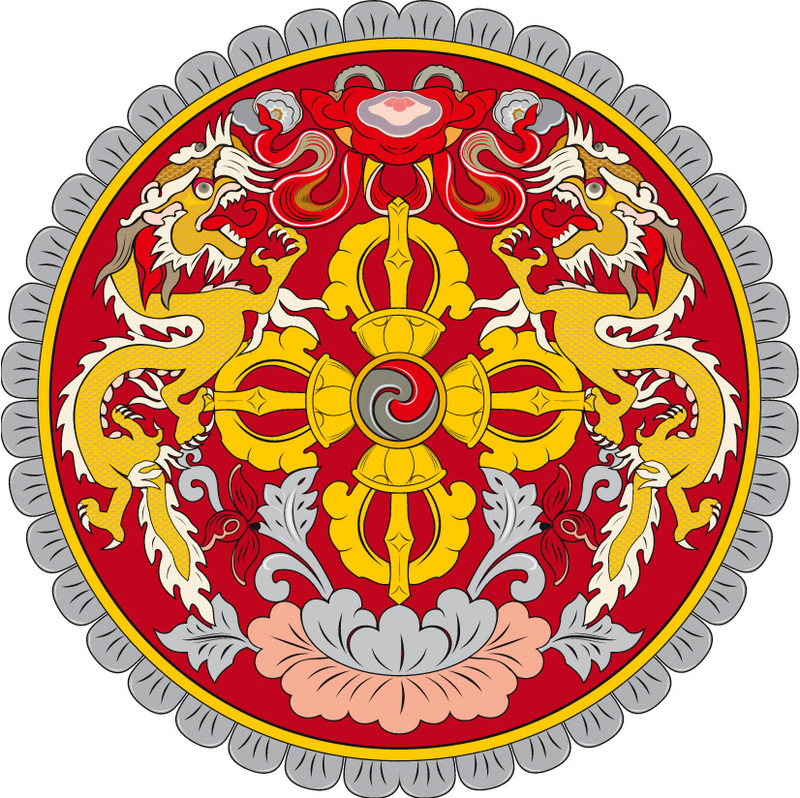 National Emblem: It is a circle inside which are two crossed vajras placed over a lotus circled by a dragon on each side. The wish-fulfilling jewel is located above them. There are four jewels inside the circle where the two vajras intersect. They symbolize the spiritual and secular traditions of the country based on the spiritual undertakings of Vajrayana Buddhism. The lotus represents purity; the wish-fulfilling jewel is the sovereign power of the people and the two dragons, the name of the Kingdom. National Anthem: “Druk Tsendhen” is the national anthem. It was first composed in 1953 and became official in 1966. 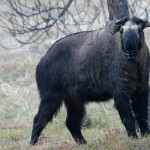 National Animal: The Takin (Burdorcas Taxicolor) is an extremely rare mammal. 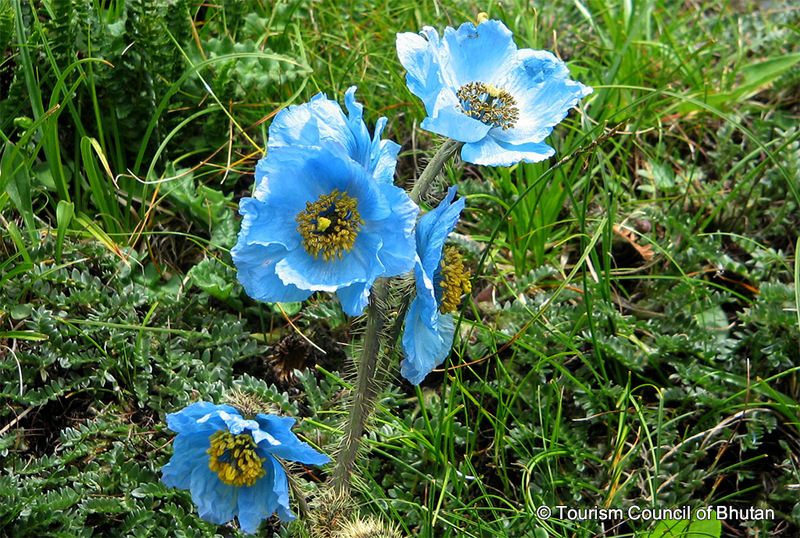 It herds in steep and thick woods at an altitude of around 4,000 meters. Legend has it that in the 15th century a Tibetan saint, Drukpa Kunley popularly known as the ‘Divine Madman’ created this unique animal. 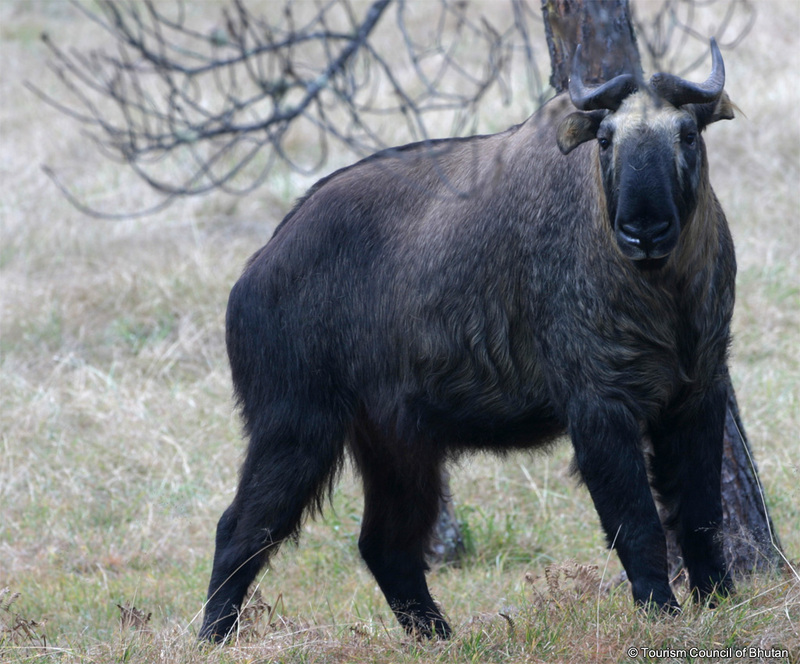 Its features resemble a quaint blend between a cow and a goat. National Bird: The Raven (Corvus Corax Tibetanus) represents one of the most powerful deities of the country, Jarog Dongchen. It is believed that the deity took the form of a raven to guide and unify the country. It looks quite similar to the crow but the raven is much larger. National Butterfly: Ludlow’s Bhutan Swallowtail, a rare endangered butterfly was declared as the National Butterfly in 2011. 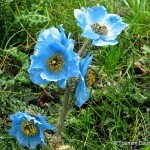 It was rediscovered in the country in 2009 after 75 years. National Tree: The Cypress (Cupressus Torolusa) is locally known as ‘Tsenden”. The cypress grows between an altitude of 1,800 to 3,500 meters. It is an evergreen tree that grows up to a height of 45 meters. Its ability to survive on rugged terrain represents bravery and simplicity. National Dress: Zhabdrung Ngawang Namgyel introduced the gho and the kira in the 17th century. 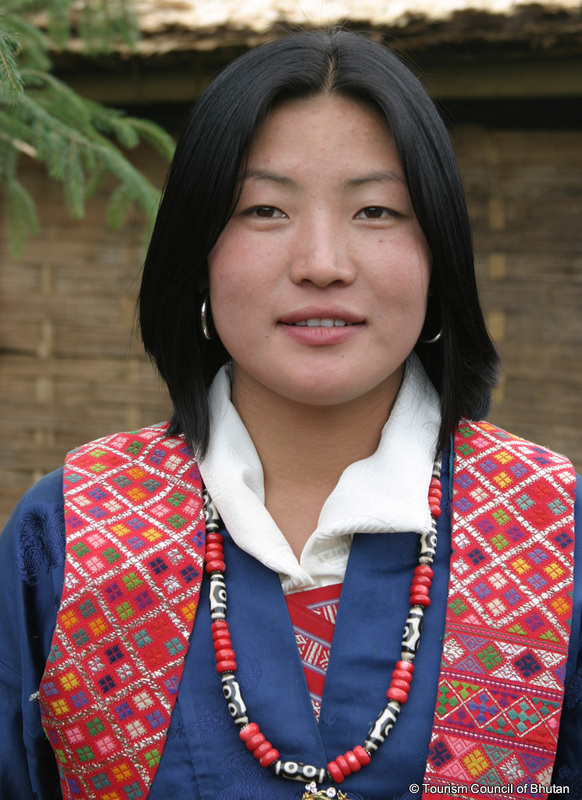 The Bhutanese women wear an ankle length rectangular piece of dress called the Kira, which is held in place over the shoulder with a pair of komas (broaches with hooks) and a hand woven belt known as the kyera on the waist. Under the Kira, women wear a wonju (blouse). A toego (open jacket) is worn over the dress. The men wear the gho, a long robe. It is worn till the knee, tied at the waist with a small hand woven kyera (belt), above which a large pouch is formed. Wearing long socks and shoes completes the costume. 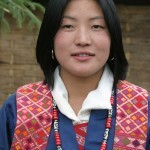 All Bhutanese are required to wear the kira and gho in offices and administrative centers. For all official/formal occasions, men are required to wear a Kabney (scarf) and the women the Rachu (scarf) with their dress. The color of the Kabney designates the rank of a person. 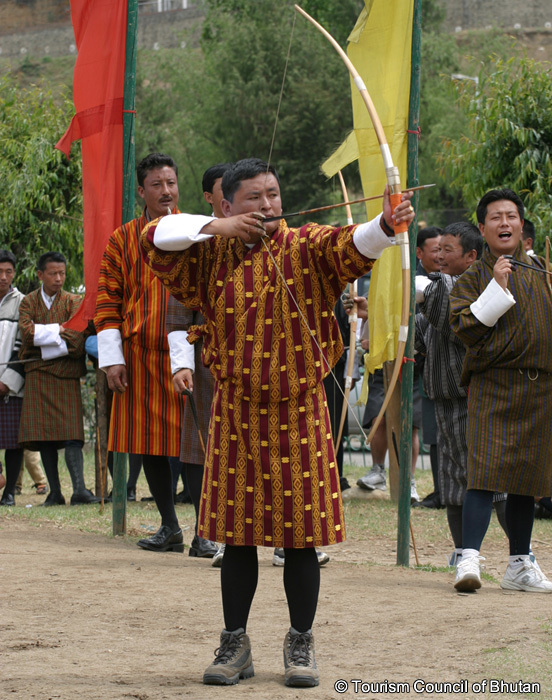 National Game: Archery is the national game of Bhutan. 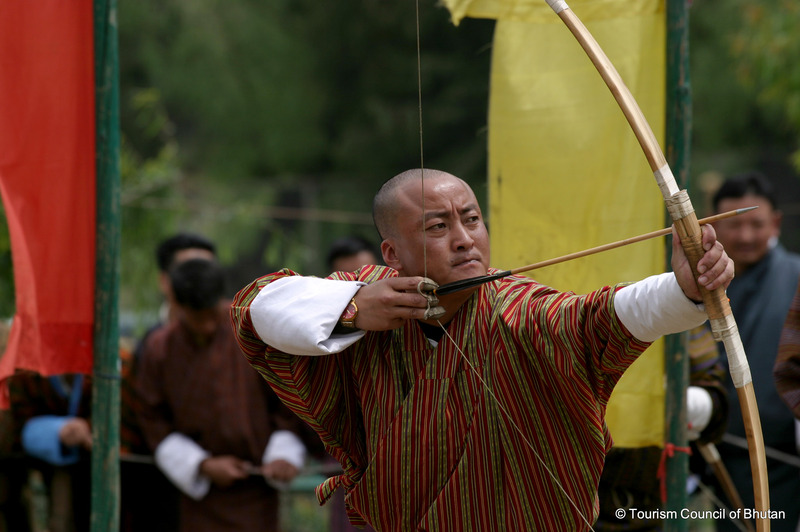 The bow and arrow plays a significant role in many Bhutanese myths and legends. 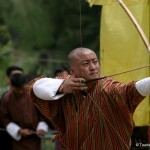 It was declared the national sport in 1971 when Bhutan became a member of the United Nations. The game is played during tournaments or leisure. It is also played during religious celebrations and local festivals. Over time the traditional bow made of bamboo has been replaced by compound bows. However, there are people who still play it the traditional way. National Day: December 17 is marked and celebrated as the National day. This was the day the First King of Bhutan was crowned at the Punakha Dzong in 1907. National Language: Bhutan is a multi-lingual society. There are 19 different languages and dialects spoken in the country. Dzongkha, meaning the language of the fort, is the national language of Bhutan. It is widely spoken in the western region. National Dish: Ema Datshi, a chili and cheese stew, is Bhutan’s national dish. Bhutanese either use dried red chilies or green chilies to make this dish. It is very simple and fast to cook. National Stadium: Changlimithang Stadium in Thimphu serves as the National Stadium. 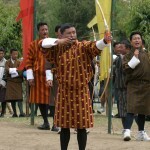 It is mostly used to celebrate national events, football and archery games. It was built in 1974 and refurbished in 2007. It can accommodate up to 25,000 people. National Museum: The Ta-dzong in Paro which was established in 1968 is the National Museum of Bhutan. It houses extensive collections of over 3,000 works of Bhutanese art covering more than 1,500 years of Bhutan’s cultural heritage. National development philosophy: Bhutan believes in the philosophy of Gross National Happiness. Sustainable development and happiness are emphasized more than Gross Domestic Product. Each and every policy of Bhutan first has to go through a checklist that qualifies it to be passed as a Gross National Happiness policy.